Tomorrow is St. Patrick's Day. Though we don't celebrate it, my daughters insisted that we make something green that I can post here. So, that's what we did early morning yesterday. 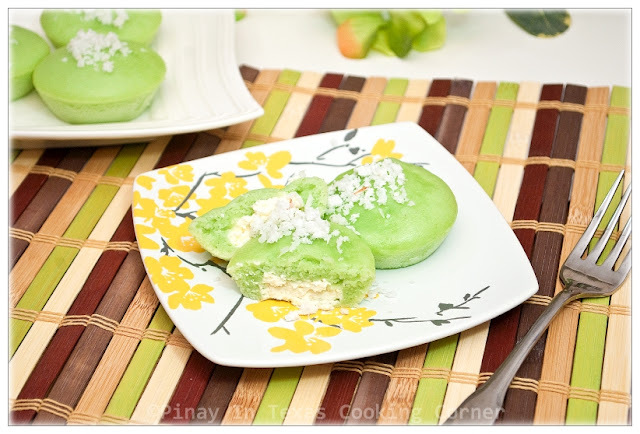 With our jammies still on, we made these pandan flavored Puto, and then ate them for breakfast. In the Philippines, Puto refers to a kind of steamed rice cake that is usually served and eaten with butter or grated coconut, either for breakfast or snack. The traditional puto are made in big round shapes about 1 to 2 feet in diameter and 1.5 inch thick, which are then served or sold in diamond shaped slices. Because of its popularity, different versions of puto came out. 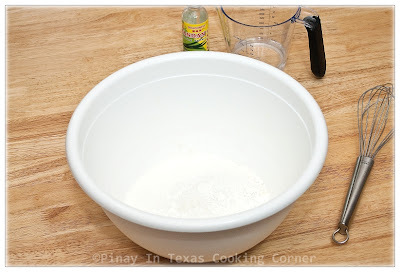 The one that we usually make is more like the Puto Mamon version which makes use of ordinary flour instead of rice flour. This variety of puto is usually steamed in individual aluminum or plastic molds which come in different sizes ranging from morsel to cupcake size. It is also made with different colors and flavors, making it more fun to eat. The ones we made yesterday are pandan (a tropical plant which is widely used in Asia as a flavoring) flavored so we would achieve the green color we want. 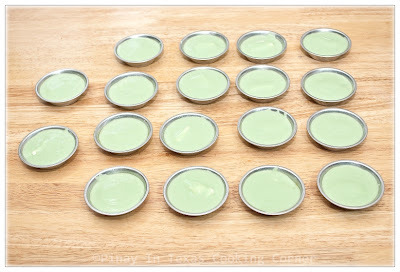 Instead of a Meatles Friday recipe, let me share with you these green treats for St. Patrick's Day just as my daughters requested. Clarise and Cherlin love puto with cream cheese filling so that's the version I'm sharing with you. Hope you'll like it. 4 oz. cream cheese, cubed into 18 pcs. 1. Lightly grease puto or cupcake molds with non-stick spray. 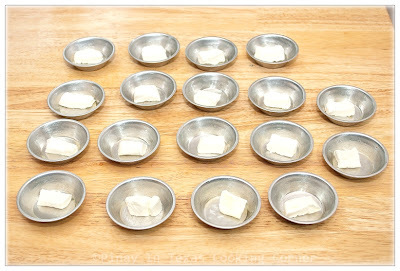 Put 1 cube of cream cheese in each mold. 2. 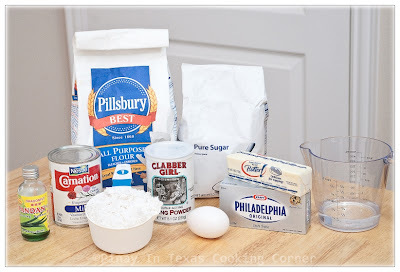 In a bowl, mix all purpose flour, baking powder and sugar. 3. 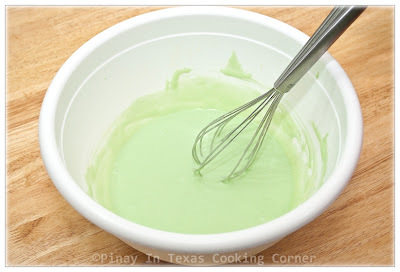 Slowly add and whisk pandan extract, butter, water, milk, and egg until smooth and well combined. 4. Pour batter into prepared puto or cupcake molds. 5. Put enough water in the steamer and bring to a boil over medium heat. 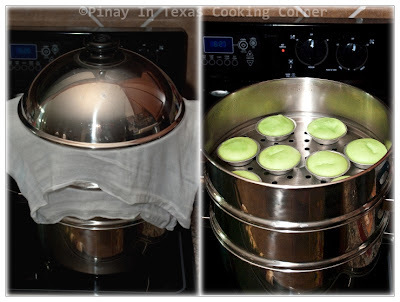 Arrange molds in the steamer pans. Place cheesecloth in between each pan to avoid water drips. Steam for 25 minutes. 6. Remove from steamer and allow to cool down completely. Remove from molds. Transfer to a serving plate and serve. PiTCC has a giveaway going on from Next Day Flyers. If you haven't joined, please do for a chance to win a set of 100 2"x3.5" custom stickers worth $35.95 with free shipping. 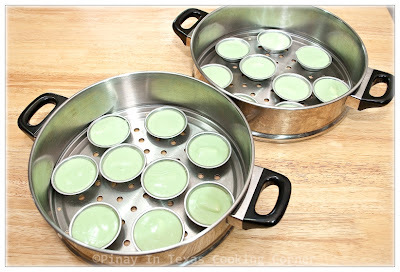 Thanks for this post about steamed pandan rice cakes. They look amazing. How wonderful you made something green! We celebrate I just haven't made anything green. These look tasty! Have a wonderful week! WOW! These sounds really, really good and they look mouthwatering! Perfect for St. Patty's Day! Thank for the girls for making you share this wonderful, wonderful sweet! I like your Asian touch puthu with pandan flavour Tina. My mum used to make this so often when I was growing up those days for the same reason, that is for breakfast. I somehow have given up making this puthu and thanks for the reminder. Looks very nice and love that color. REALLY cute green dessert! We have steamed cake too, and I can already imagine how delicious this is! Using pandan leaves is wonderful idea. 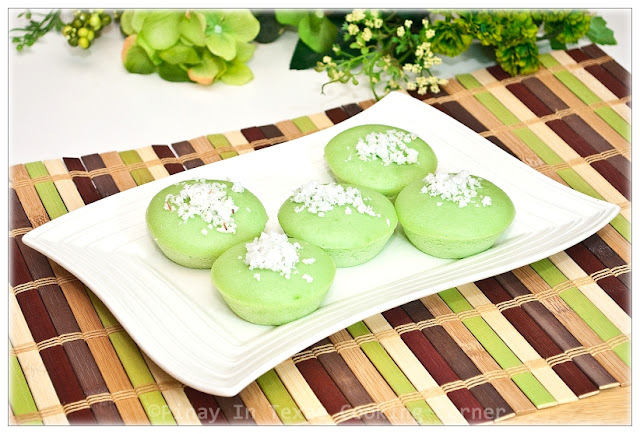 I haven't yet had an opportunity to buy and use the pandan leaves but it's on my list to make! I love this recipe, Tina! I used bottled pandan extract, Nami. Haven't found fresh nor frozen pandan leaves here. 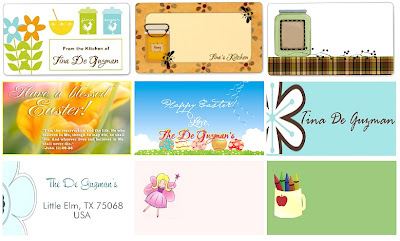 I love your green little cakes Tina! Your daughters are such an inspiration aren't they? What a nice treat! 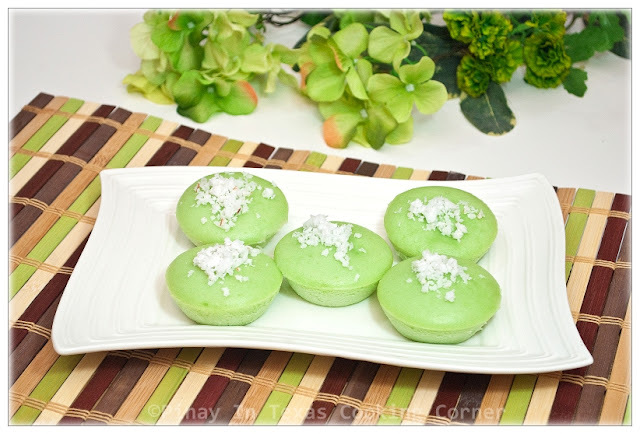 Pandan gives such a fantastic flavor to desserts. BTW, I also like your steaming racks. I have a similar one that came with my electric pan. Wish they would sell the steaming racks separately so that I can get an additional one to stack. Amazing color! Looks so beautiful and tasty!!! Oh, you are such a sweet mom...I know your girls were delighted with these beautiful green cakes! How creative of you putting the dollup of cream cheese in the pandan! I have seen a lot of pandan recipes, but never one with cream cheese. Very festive item for St. Patricks, glad your daughter insisted on green or I would not be looking at this today. Well done! will try this . . . already tried the creamy pork chop and it was fantastic! Putting cream cheese in pandan is brilliant idea. Hey, I think we've this in S'pore too! Very nice colours & full of flavours. I'm sure it's a sell-out! wow...the pandan cakes looks so so beautiful....loved the idea of putting cheese in the cake....they look gorgeous n yummy dear ! I always remember eating when I was a little girl living in Singapore. Having cream cheese in each individual cake is a fantastic idea! Making cream cheese filling by placing little cubes of it in the molds before pouring the batter IS GENIUS! why haven't I thought of that? This looks so great! Oh yummy! I just had some puto but I've never thought to put in cream cheese. I'm going to have to make this soon, I love the whole idea.